Last week's teaser trailer for Star Wars: The Last Jedi had just a brief glimpse of Poe Dameron and BB-8. 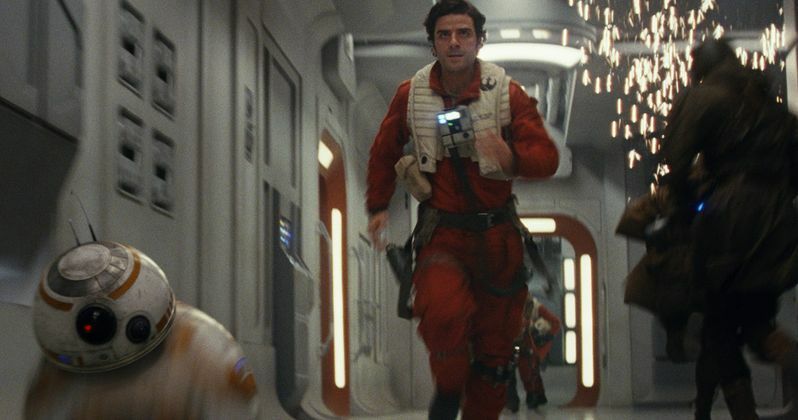 We see Poe running towards an X-Wing, presumably his, as BB-8 is rolling along. The ship explodes spectacularly in front of them, as they are seemingly under an intense attack. This scene is without context, so we have no clue what's really happening. But now we know that Poe is under a lot of duress in the movie, and he will be facing the biggest challenge of his life. We can already infer from the panels at Star Wars Celebration that The Last Jedi is this trilogy's Empire Strikes Back. Director Rian Johnson has said that despite the destruction of Star Killer Base, The First Order is not sitting on their laurels. They destroyed the Republic government and are making big moves against The Resistance. It's strongly presumed that while Rey is getting her training on with Jedi master Luke Skywalker, her friends and allies are being attacked ferociously. Poe, referred to by Kylo Ren as "the best pilot in The Resistance", will probably be a high value target in any First Order offensive. He shredded them at Maz Kanata's castle, then delivered the finishing blow to destroy Star Killer. I'd bet that a primary goal in any First Order strike is to take Poe Dameron out of the picture. All conjecture, but it makes sense why we would see his fighter being blown to bits. Oscar Isaac, who plays Poe, was in New York doing press for The Promise this week, promoting his upcoming drama about the Armenian Genocide. All the Star Wars actors are under strict orders to keep the plot of the film secret. Isaac didn't reveal specific details, but did offer a few hints suggesting that we'll see more of Poe's backstory, and that he'll be put to the challenge like never before. "Well, you know I can't say anything about the thing itself. But...He will be challenged, in a very intense way that will reveal a lot more about his character." Asked about his excitement level for Star Wars: The Last Jedi, having not been able to participate in Star Wars Celebration, Oscar Isaac seems in good spirits about the whole thing. He says this. "They've created a culture of it. So to be part of that, definitely. I've joined the ranks of a whole other world, another universe. There's one coming in December, and the one after that...[I'm down for] at least two more. (Laughs)"
He doesn't give away specific plot points, but perhaps we'll finally be learning a lot more about his character and his history with the Resistance. That's great to hear. Poe's almost as mysterious as Rey. Apart from his incredible piloting skills and nerves of steel, we know zilch about him or his back story. If The First Order is laying a beatdown to The Resistance, Poe ostensibly will be in the thick of that conflict. My personal theory is Poe has some ability in the Force. Granted, he could just be a bad-assed pilot, but we see him do incredible feats in his X-Wing. Who knows, maybe he'll get in on that sweet Jedi training with Luke as well. It's pure speculation of course, but to me, would not be a surprise. December 15th can't come soon enough!